I just LOVE these Valentine Heart Bath Bomb Fizzy for $3.79 (Retail $9.99) - which will be much better in my daughters gift basket vs chocolate. 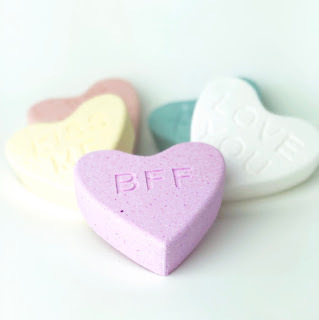 This Valentine's conversation heart bath bomb is the perfect gift for friends and family for Valentine's Day! Multiple options so you can choose the perfect color and phrase for the person you have in mind! Make sure to get multiples!